Homes for Sale in MacDonald Ranch. 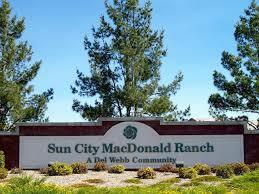 MacDonald Ranch in Henderson, Nevada is Del Webb’s second active adult community in the Las Vegas area. Nestled at the base of the Black Mountains adjacent to the I-215 Beltway, Sun City MacDonald Ranch is conveniently located just minutes from the sites and sounds of the Strip and downtown Las Vegas. Sun City MacDonald Ranch has 2,513 single-family homes and villas spread across 564 acres, making it the third largest of the Sun City communities in Las Vegas. It is more intimate than the larger Sun City Anthem and Sun City Summerlin communities, but the cozier feel and ideal location is precisely what residents of Sun City MacDonald Ranch cherish most about their community. It sits at an elevation of 2,100 to 2,400 feet where it enjoys magnificent views of the valley and surrounding mountains. The community was constructed between 1996 and 2001 and now offers an exciting mix of single family homes and villas. Contact Tracy Drown for Real Estate at 702-245-9341. THIS SOPHISTICATED & MODERN BLUE HERON HOME begins at the private portico/courtyard entry w/custom tile & slate. Interior concrete floors give true flair to this designer beauty! The expansion of your Indoor/outdoor living space w/pocket doors at great room enhance the many upgrades & fine finishes throughout. Quartz & Granite counters, SS appliances, LED ltng, Loft w/custom bar, custom closets & A CUSTOM MOVIE ROOM-IT'S SPECTACULAR! A TRUE GEM!! WOW!! Check out this listing in the exclusive Blackrock community! Don't wait for new construction building times, this one is ready to go right NOW!! Over $250,000 in upgrades, a must see in this price range. Sanremo floor plan just built in October. Open floorplan that is an entertainers dream. Hurry, this won't last long at this price! !